Ski Pad evacuation mat, designed for the safe removal of mobility impaired individuals from fire or other emergency situations. 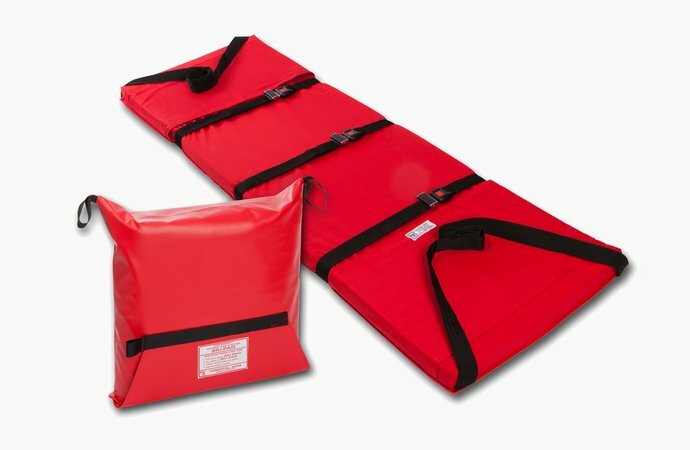 The Ski Pad evacuation mat, produced by Hospital Aids, has evolved from their popular mattress evacuation aid the Ski Sheet - which remain in place, attached unobtrusively under a patients mattress at all times, allowing it to be instantly accessed if an emergency evacuation is needed. The Ski Pad was designed to aid in the evacuation of non-ambulant patients in premises such as hospitals, care homes and hospices, where staircases or fire escapes were too narrow to allow movement of the patient on either bed or mattress. Since the introduction of 'The Regulatory Reform (Fire Safety) Order of 2005' - which states that the Fire Service is no longer obliged to provide a "complete evacuation service" for premises placing the onus upon the business owners, and changes in the 'Disability Discrimination Act' - which now states that everyone has to have the same right of evacuation in an emergency situation. The Ski Pad is now being used in any premises where mobility impaired/ disabled people would require assistance to evacuate such as hotels, offices and schools throughout the UK, Ireland and in many overseas territories. The "standard" Ski Pad consists of a cotton top and vinyl base, 5cm thick internal foam pad, two webbing cross straps with seat belt style metal buckles, a foot pocket and webbing pulling handles at each end. Ski Pads are suitable for use with both adults and children as it can be adapted to suit their varying needs. 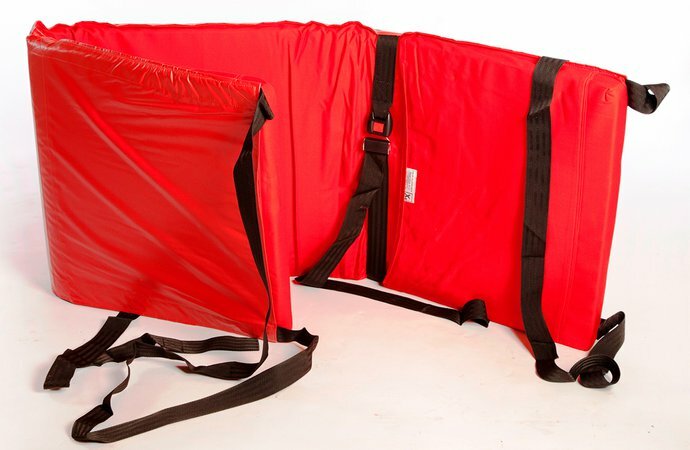 For example, smaller versions can be produced for children/small adults, padding can be increased for patients with brittle bone disorders or a third cross strap can be added for extra patient security. The Ski Pad comes complete in a storage bag which can be wall mounted at the head of fire escapes, in rooms or along corridors. 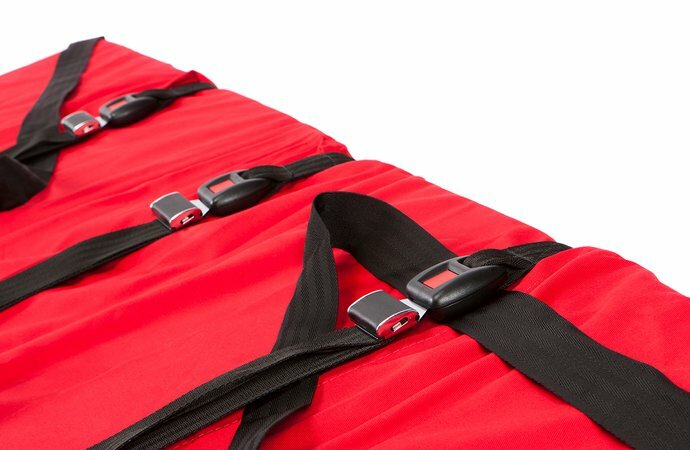 When needed, in an emergency, the Ski Pad is quickly and easily removed from its storage bag by pulling the velcro tab - if the Ski Pad is wall mounted there is no need to take it off as the pad will simply fall to the floor once the velcro fastening is released. 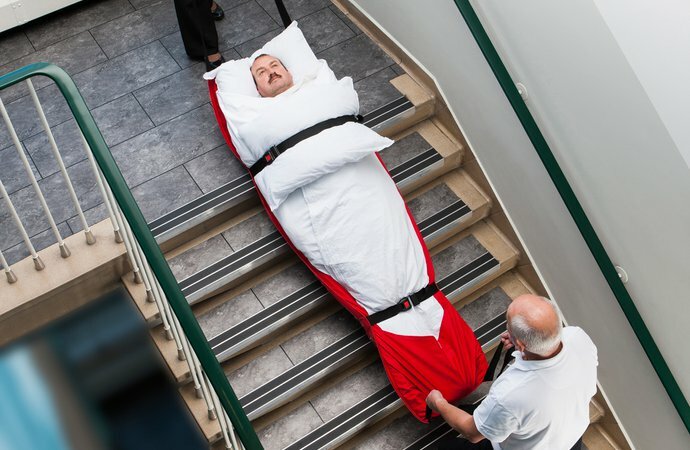 Once the Ski Pad has been laid out and buckles unfastened, the patient can be transferred on to the pad - this can performed from a bed, floor, chair or wheelchair, and his/her feet placed in the foot pocket to prevent him/her from slipping down the mat when being moved down flights of stairs. 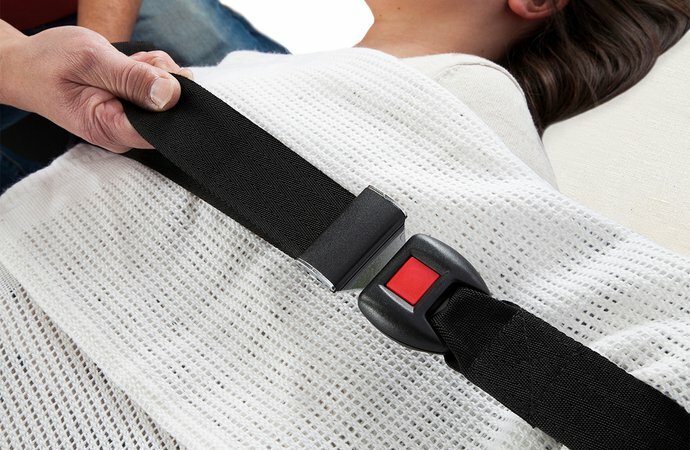 The seat belt style metal buckles can then be fastened over the individual and adjusted for a snug fit, securing the user safely on the Ski Pad - if available pillows can be placed over the individual's chest and legs prior to fastening for extra comfort once strapped in. The Individual is then ready to be towed to a point of safety. The durable vinyl coated base material enables the Ski Pad to move over virtually any surface and the internal foam offers protection to the individual while being moved down stairs. The Ski Pad has been safe load tested to a weight of 160kg (25 Stone) however, to reduce the risk of manual handling injuries to handlers, the maximum weight being pulled should not be more than that of the combined weight of the handlers - as a general rule the safe working load for two handlers is 120kg. Each individual, who would require assistance during an evacuation, should have their own handling plan (PEEPS) and this should be considered and equipment assessed in line with that plan prior to any use. It is advised that only a Ski Pad that has been used for staff training or partial evacuation within a building (between internal fire safety zones) may be cleaned if it becomes dirty - However only the vinyl base and storage bag can be cleaned. If the Ski Pad requires cleaning, the vinyl components can be wiped with antibacterial wipes and air dried. To renew the base surface of a training mat and help it slide, a spray polish may be applied and then buffed with a clean, dry cloth. Only once all the components are fully dried, should the Ski Pad be stored away in its bag. If the top cotton becomes soiled it is recommended that the Ski Pad be replaced to prevent cross contamination. An "all vinyl" Ski Pad can be produced to help meet individual organisations cleaning policies. If a Ski Pad is used for a total evacuation and is pulled over road surfaces or gravel, the vinyl base may become worn and unfit for use after the evacuation process has been completed. At this point, the Ski Pad has done its intended job and should be replaced by a new Ski Pad in line with your fire safety policy and risk assessments. 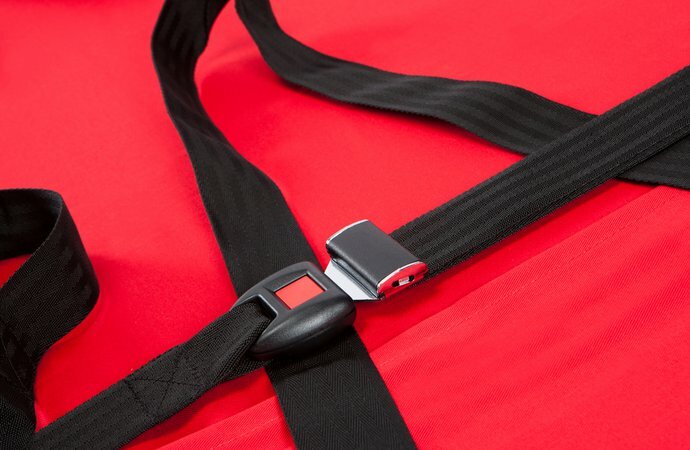 After use or cleaning, visual checks should be made on the stitching, buckles, vinyl base and all webbing. If any damage has occurred the Ski Pad should be replaced. Many variations of Ski Pad can be made to order such as two or three Strap, double thickness, 5ft, large foot pockets and all vinyl versions. Can a Ski Pad be used in any building? Yes - depending on the size and style of stairwells and landings. Is the Ski Pad suitable for bariatric individuals? The Ski Pad has been safe load tested to a weight of 160kg (25 Stone). If an individual of this maximum weight is to be moved multiple handlers will be required to move the pad safely - please refer to the safety instructions for advice on safe working load weights. 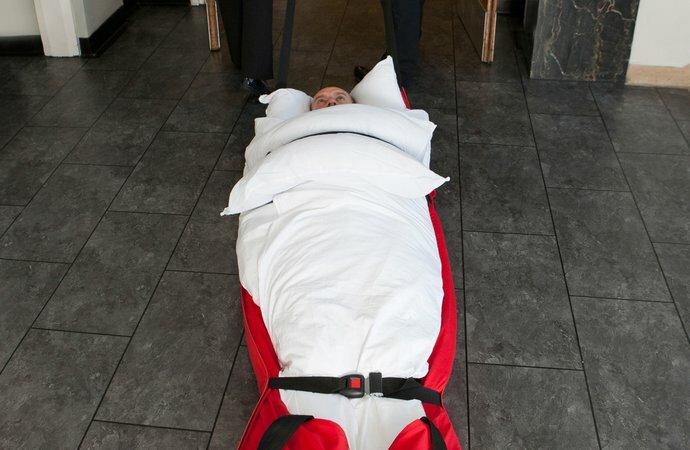 If a very large/obese/bariatric individual is to be moved, a device such as the Bariatric EvacMat, also available from Hospital Aids, should be considered - this device solves the problem of body mass stabilisation, has a SWL weight of 350kg (55 Stone) and has multiple ladder handles allowing for multiple rescuer contact. What happens if the Ski Pad is used in an emergency? Once used in an evacuation - if any damage occurs, it is recommended that the Ski Pad should be replaced - see cleaning and care. Are Ski Pads ok to use with very elderly or fragile patients? The Ski Pad is ideal for use with elderly or fragile patients as they are protected while being moved by the internal foam pad. If the patient has is suffering from brittle bones, then a double thickness Ski Pad, should be considered. Does a Ski Pad need maintenance? See cleaning and care instructions. Visual Checks should be made after each use. Should any damage occur to stitching, webbing, buckles, base or foot pocket it should be replaced. It is also recommended that Ski Pads that haven't been used are occasionally checked to ensure that they haven't been tampered with. Are Ski Pads supplied with wall fixings? No. Due to varying policies on safe, appropriate wall fixing for individual organisations/companies, Ski Pads are not supplied with fixings. However, suitable heavy duty hooks can be sourced from any good DIY store. Is the Ski Pad MRI and X-Ray safe? The standard Ski Pad has metal buckles so therefore it is not suitable for use in MRI or X-ray areas. However, plastic buckles can be fitted instead of metal making them MRI and X-ray compatible. Free product demonstrations are available on the Ski Pads throughout the UK, Ireland and other distribution countries, subject to prior arrangement and availability of consultants. Training packages are available throughout the UK, Ireland and other distribution countries, subject to prior arrangement.